One of the ways to engender camaraderie among students and to instill a sense of school pride is to give the children something to rally around. This is why the vast majority of schools have signage featuring their mascot, school colors, and other branding. The First Academy recognized this, so they contacted the friendly experts at Citrus Sign Studios for school band banners Orlando would notice. What Is The First Academy? Located on Bruton Boulevard in Orlando, The First Academy is a Christ centered, college preparatory school that serves more than 1200 students in kindergarten through twelfth grade. Their students have been elevated to the highest levels of achievement thanks to the fine arts, athletic, and academic programs they have offered since 1987. Banners to brand the school drum band! When a school that does so much for area children came to us for signage, we were more than happy to help out. 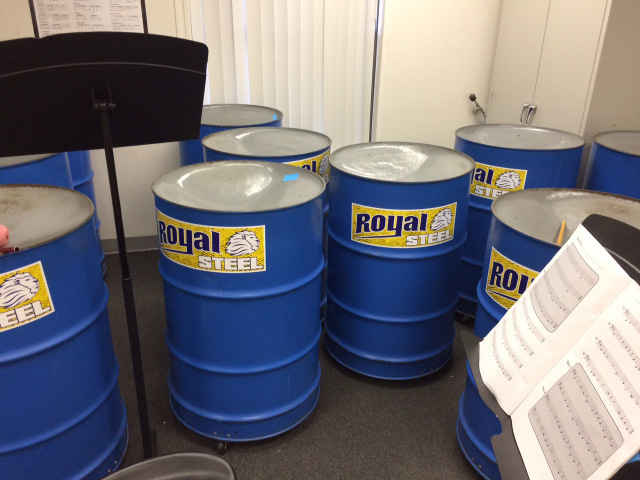 One of The First Academy’s fine arts programs is a steel drum band, known as the Royal Steel band. As they play at functions and events, the band wanted to have signage that would promote their identity. So, they contacted Citrus Sign Studio for school band signs Orlando would remember. 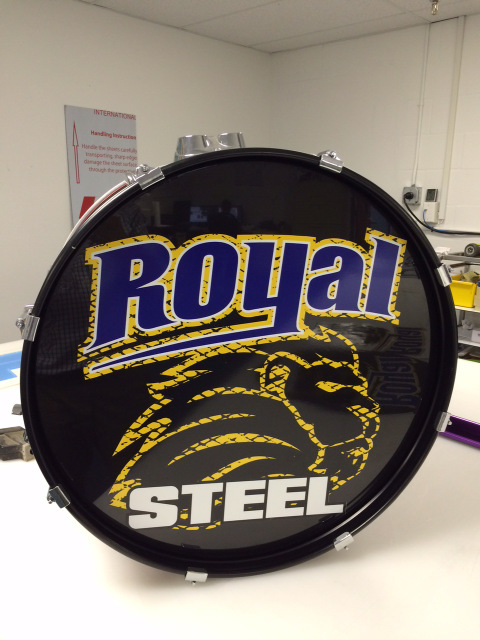 We created a number of items for the Royal Steel Band. 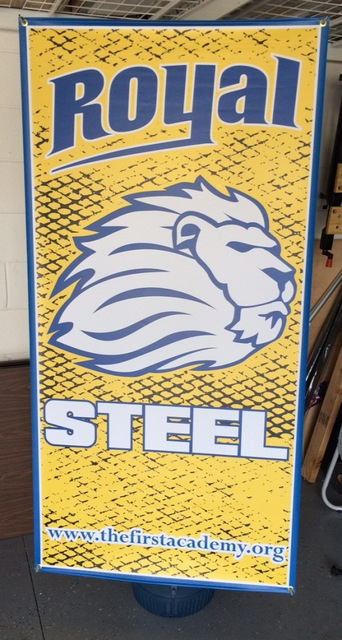 Each sign features the school colors of royal blue and yellow as well as their “Spirit Lion Head” logo. 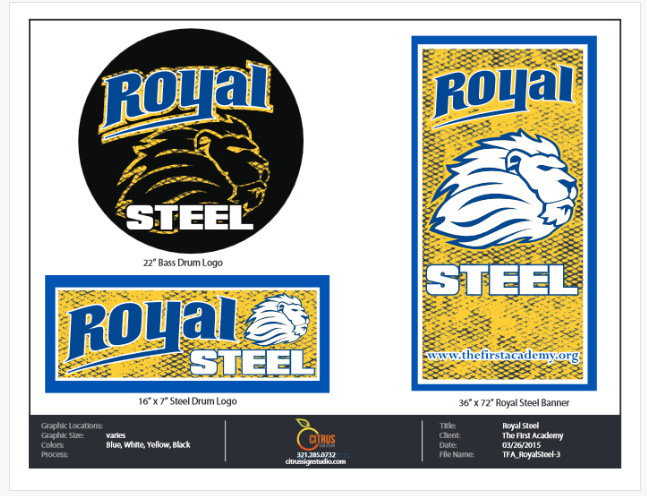 We were also able to perfectly replicate the school’s font for the “Royal Steel” name. First up, we designed a drum head cover for the bass drum. We digitally printed the logo on self-adhesive black vinyl to complement the colors of the drum set. Next, we created large six inch by seventeen inch magnets that can be reused and placed on the front of any of the steel drums of varying sizes. 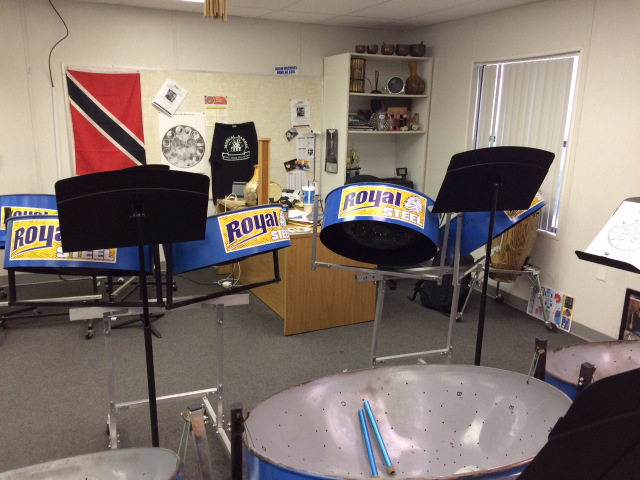 Finally, we provided the Royal Steel Band with a three foot by six foot banner with a stand. This is a portable sign that can be easily set up wherever the band is playing. For this banner, we also added the TFA website address. In the end, with the new brand identity and signage, the student band had great pride in what their group. And, we had another satisfied customer. As your various clubs, teams, and performance groups go out into the community, it is important to make it clear that they represent your school. This is especially true for private institutions that are trying to build their reputation and attract new students. With vibrant signage featuring your school’s branding, you can announce who you are. Magnets on the barrel drums! Within your facilities, markers emblazoned with your mascot give students a sense of pride. They can also be used to display accomplishments, such as high scores on standardized tests or athletic conference championship wins. We always offer artwork proofs! When you first contact Citrus Sign Studio, we listen to your vision, goals, and budget. We then come up with ideas that suit your needs and provide you with proofs of exactly what you can expect. We work with you through every step of the process. Are you ready to build pride in your school while increasing brand recognition? If so, contact us today for a free quote and consultation.